This article will present a new freely available development poster for Agile, referencing XP's cyclic life-cycle model. There are several Agile posters available on the Internet. However quite a few of them are outdated. Hence I have created and made freely available a new poster that highlights some of the current Agile techniques and how they correlate to one another. Before we begin some of the explanations behind the posters elements, it should be noted that the author is well aware that it is a 'noisy' poster. 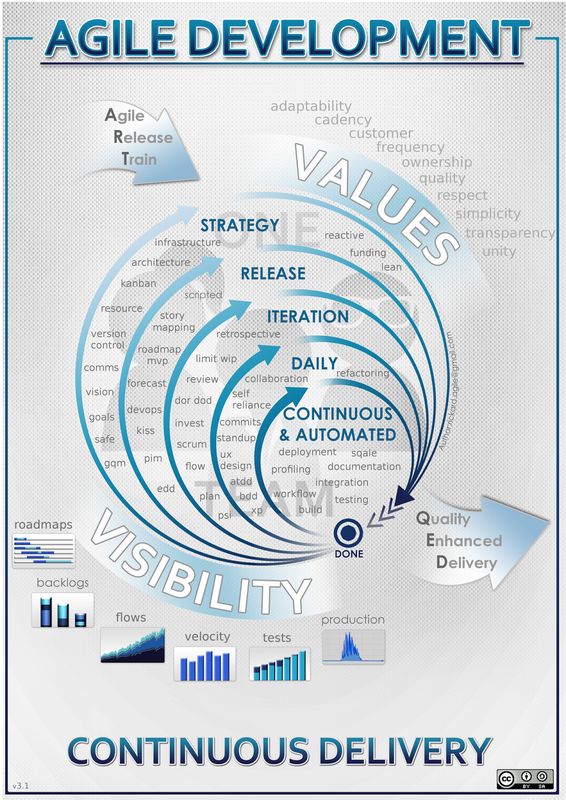 This is not a poster you would show people who are new to Agile, especially Business users. This complexity is somewhat resonate of Agile complexity in general. If this is too complex for any readers, then the suggestion is to ignore this poster and move on to better, simpler ones. After all this is the Agile way, use what you need, leave the rest. Some readers may see the similarities between this new poster and other posters. However all the images used to make the poster have bee originally created (not copied) and the cycles of activity represented by circular arrows were taken from diagrams directly associated with XP  (which others have also copied themselves). Not only that but an important concept for visibility of Production is present within the poster. For with production Agile as we know is a Continuous Delivery . We can also see that ART  goes in and QED comes out. Where ART not only represents the value stream of the release train, but also the craft that goes into Agile. QED not only represents a Quality Enhanced Delivery but also the Latin term "quod erat demonstrandum"  meaning "which had to be demonstrated”. Often one of the goals of an Agile feedback loop. The rhythmic delivery nature of Agile is represented by the labels of cadency  and frequency. Other important labels are that documentation is automated as much as possible, along with profiling, integration and all the rest! Daily self reliance with commits are activities often required by teams. Where the team is represented by the background image of One Team. Along with the newer strategic approaches of SAFe  and older ones such as GQM . We could go on, but I think the poster speaks for itself.